Next Generation Sequencing Market Size was valued at USD 4.1 billion in 2018 and is expected to witness 20.4% CAGR from 2019 to 2025. Technological advancements integrated in next generation sequencing techniques will positively influence next generation sequencing (NGS) industry growth throughout analysis period. Extensive use of such upgraded next generation sequencing technique in analyzing DNA sequence has propelled its preference in research processes. NGS technology has revolutionized the way of data analysis and interpretation of large genome bases that has helped the scientists and researchers to discover drugs for fatal diseases. For instance, next generation sequencing enables analysis of cancer samples to detect rare somatic variants and tumour subclones. Moreover, through whole genome sequencing, scientists can sequence entire genome in a single experiment. Companies such as Illumina develop software that can deliver data output ranging from 300 kilobases up to multiple terabases in a single run. Availability of such technologically upgraded software integrated in NGS instruments will foster industry growth throughout the forecast period. Positive regulatory framework in developed economies encouraging development of next generation sequencing products will propel industry growth. Regulations imposed by the regional authorities ensure superior quality of next generation sequencing instruments and consumables being marketed. For instance, regulatory bodies such as FDA and EU Commission thoroughly monitors faults in the next generation sequencing products. Furthermore, these authorities also construct numerous protocols to eliminate defects in the next generation sequencing instruments and reduce number of product recalls. This scenario favours industry growth as guidelines imposed by authorities support advances in the NGS products. However, high cost of next generation sequencing products may hamper its acceptance thereby, affecting industry growth in developing and underdeveloped regions. Instruments segment was valued around USD 740 million in 2018 due to its increasing demand in research processes. Developed economies routinely carry out research activities to study causes of genetic diseases for finding an alternative drug or therapy. Genetic research requires quantification as well as analysis of large databases of genome. Recently developed technologically advanced NGS instruments provide accurate results that should positively influence the segmental growth. Consumables segment is expected to witness 21% growth throughout the analysis timeframe. Consumables and other chemicals are highly preferred for labelling the DNA strands that are utilized in the sequencing process. These consumables are ordered in bulk quantities from the manufacturers that proves cost-effective for researchers. This scenario proves beneficial for segment growth as replacement rate of consumables remains high due to frequent usage. Clinical application segment is projected to grow around 20.5% from 2019 to 2025. Considerable segmental growth can be attributed to growing use of NGS technology in predicting probability of an individual acquiring diseases. Recently developed techniques such as whole genome sequencing and targeted resequencing also enables the doctors to design accurate treatment for patients that are likely to suffer from any chronic disease such as cancer. For instance, whole genome sequencing allows genetic profiling and screening of patients suffering from cancer and cardiovascular diseases that helps in clinical assessment and diagnosis. Thus, high preference for technologically upgraded NGS technique by clinicians and doctors to study the cause of different diseases should spur the segmental growth in coming years. Research application segment will grow at 20.5% throughout the forecast period. Significant business growth can be associated with extensive usage of next generation sequencing technology in biotechnology sector for genetic research having commercial applications. Biologics and other commercially viable products need rigorous research process to understand attributes and complications associated with these products. Above mentioned factor increases the adoption NGS technology in research process elevating the segmental growth. Whole genome sequencing (WGS) segment was valued around USD 1 billion in 2018 and considerable revenue size can be associated with its growing usage in clinical research. Whole genome sequencing technology has been currently utilized in the genetic test kits that offers a summary of most of the variation existing in an individual’s genome. However, the cost of WGS technology is extremely high in comparison with targeted analysis due to which the WGS technology will restrain segment growth to some extent. Targeted sequencing segment will have over 19% growth during forecast timeframe due to several benefits associated with it. Targeted genotyping is a low-cost technology that is utilized in the discovery of information related to genetic risk of disease. Additionally, it also accurately measures an individual's gene pool. Aforementioned factors coupled with growing demand for personalized medicine amongst the population suffering from genetic diseases will boost the demand for targeted analysis technology. Sequencing by synthesis (SBS) segment was valued around USD 3 billion in 2018 and considerable revenue size can be associated with its wide adoption in research process. This technique is responsible for generating more significant portion of world’s sequencing data. Key industry players such as Illumina have developed superior quality SBS instruments that supports parallel sequencing of data. Sequencing by synthesis has variety of applications and the analysis provided by this technology has minimum repetition of polymers that should boost its adoption in forthcoming years. Ion semi-conductor sequencing segment will have over 23% growth during forecast timeframe. It is a technologically upgraded method of sequencing DNA based on the detection of hydrogen ions that helps to directly translate chemically encoded information into digital information on a semi-conductor chip. This technology is comparatively simpler, faster and cost-effective than any other technology available that should drive the segmental growth. Hospital segment was valued at USD 1.8 billion in 2018 and considerable revenue size can be associated with the increasing number of hospital admissions in developed as well as developing economies. Moreover, now-a-days, hospitals are well-equipped with technologically advanced devices and instruments that proves beneficial for the segment growth. Government funding to hospitals will further boost adoption of NGS instruments and services for managing complicated cases in such hospitals thereby, positively impacting segmental growth. Pharmaceutical and biotechnology companies segment accounted for 11.5% revenue share in 2018. Considerable segment growth will be due to the extensive use of NGS instruments and consumables for manufacturing biological products as well as drugs. Also, targeted sequencing and whole genome sequencing techniques have been utilized to gain accurate insights on the sequenced genomes that helps companies to manufacture drugs thus, increasing its adoption in R&D department of pharmaceutical and biotechnology companies. 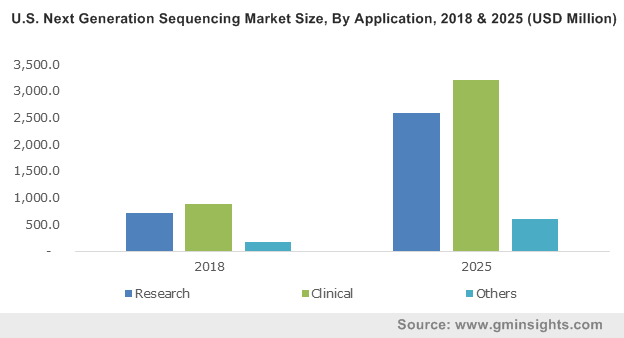 North America next generation sequencing market was valued more than USD 1 billion in 2018 and will witness robust growth over the forecast period. Increasing prevalence of cancer and genetic diseases will surge adoption of advanced NGS instruments that will drive the regional business growth. Moreover, collective focus of industry players on development of technologically upgraded NGS instruments will positively impact industry growth during the upcoming years. Europe next generation sequencing market will witness 19.7% growth over the forecast period owing to high awareness regarding availability of superior quality NGS consumables and instruments. Also, favourable regulatory scenario has supported development in the NGS instruments that will prove beneficial for the industry growth. NGS market is in matured phase in European countries due to enormous technological advancements. Therefore, new entrants willing to enter European market should consider the risk of high capital requirement before establishing their presence. 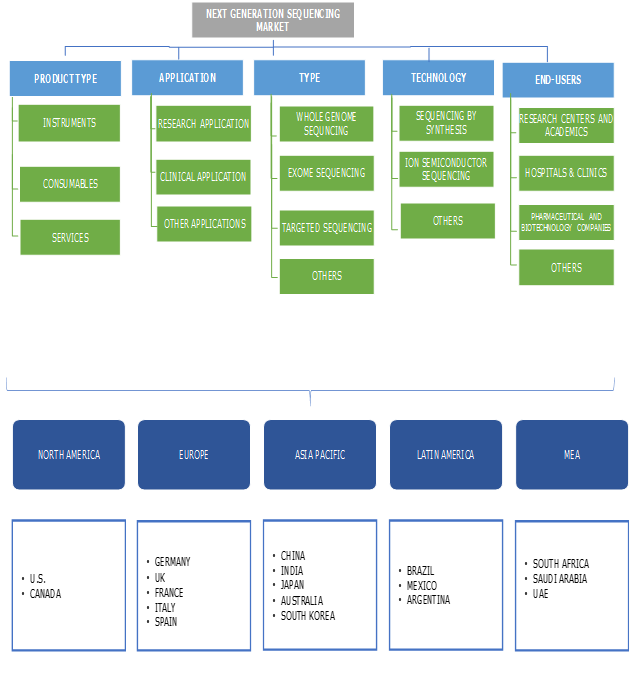 Few major industry players operating in the NGS market include Illumina, Thermo-Fisher, Roche, Pac-Bio, Long Read Solutions, BGI, Oxford Nanopore, Qiagen, Genapsys, BioRad, Agilent, NanoString, 10X Genomics. These key industry players implement several strategic initiatives such as acquisitions, mergers and new product launch that renders them with competitive advantage. For instance, in 2018, Agilent entered into agreement to acquire Lasergen company to enhance its next generation sequencing product portfolio for clinical applications. This acquisition proved beneficial for company’s growth. Genome sequencing industry can be traced back to year 1977 that witnessed the introduction of Sangers DNA sequencing technique. It dominated the genome sequencing process for about three decades. Later, after several technological advancements, next generation sequencing technique was introduced. This technique was able to sequence billions of DNA nucleotides that substantially minimized the requirement for fragment-cloning methods utilized in Sangers method. In contrast to the conventional methods, apart from sequencing for large nucleotides, NGS technology provides parallel analysis and also reduces the sequencing costs. Recently, whole genome sequencing and targeted sequencing have been extensively utilized in detecting genetic disorders. Moreover, key industry players such as Illumina provides high quality industrial-level sequencing NGS instruments that enhances the genome sequencing process proving beneficial for the industry growth.